Amazingly, there have not been extensive, statewide studies made of most cave animals. Endangered bats, cavefish and a few other species have been widely reported on, usually by people affiliated with the Missouri Department of Conservation, who have the necessary permits to seek endangered or threatened species. Invertebrate Fauna from Missouri Caves and Springs by James E. Gardner is a fairly comprehensive 20 year old study of invertebrates. Dr. Michael Sutton and associates have done more recent work, and Dr. Bill Elliott, MDC cave biologist, is compiling a statewide cave biodiversity database. 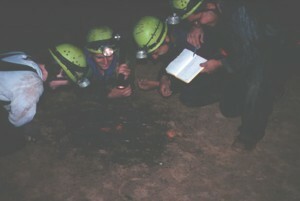 For many years, Dr. David Ashley has conducted cave invertebrate ecology studies. Many academics have studied the fauna of this cave or that species. 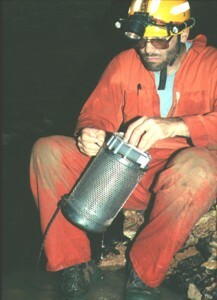 Dr. Dave Ashley with a "critter trap"
But a comprehensive overview of cave life in this state does not yet exist, and more work is needed. 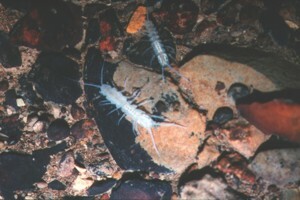 As recently as 1999, a species of cave crawfish new to science was discovered here, and undoubtably other undescribed species exist in there. What does it take? Mainly an observant eye, a notebook and pencil, and some way to key the animals--that is, to know which is which. Count and identify cave animals you see. Note numbers of adults and young, if that applies. Avoid disturbing hibernating bats, or bats with young. Record where and under what conditions you see them--in the water, among leaf litter, and so on. Identify only those who know. It is better to call a bat "one of a myotine species" than to identify it as a Myotis lucifugus unless you are sure. Work with biologists from a local university or one of the state agencies. These people are usually interested in working with serious amateurs in exchange for the data you can provide. Observe state laws, and do not harrass, injure or collect the animals. If such collection becomes necessary for identification, get the proper permits before you do so. Above all, share your information. Whether you write a paper or book yourself, or contribute to the work of others, data sitting only in your filing cabinet or on diskette is not yet science until it is shared.